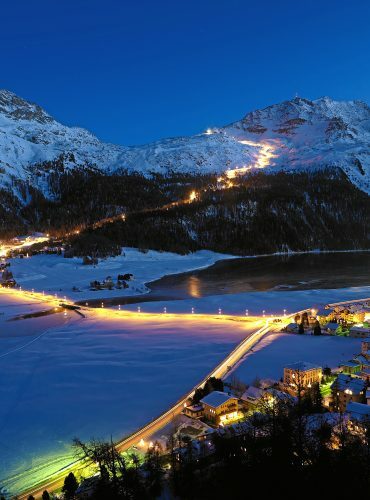 NEAREST AIRPORT: St. Moritz airport or nearest international airport is Zurich 215km – 3 hours or Milan 175km – 3 hours. 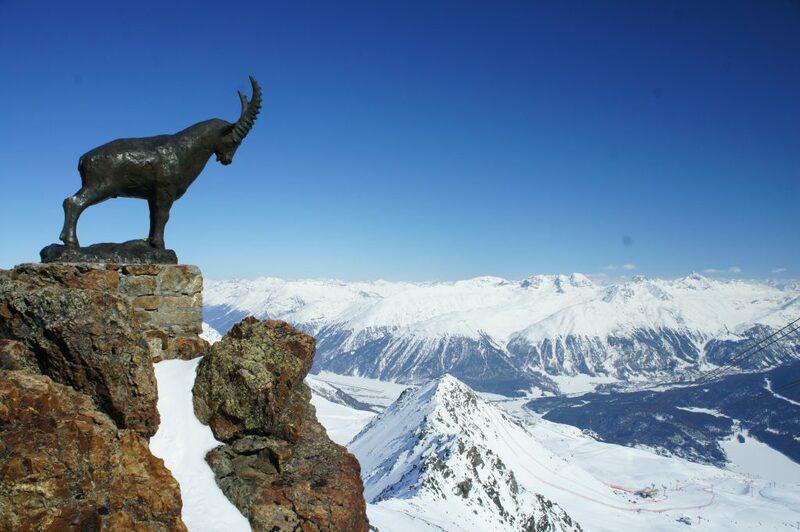 St. Moritz in the Engadin valley is written into the pages of alpine history. The Legend goes that Swiss hotelier Johannes Badrutt made a wager with four of his British summer guests in the year 1864. He claimed that an Engadine winter was full of sunshine and far more pleasant than an English winter. He invited his guests to stay and if they were not satisfied their travel costs would be reimbursed. Needless to say, they arrived in time for Christmas and stayed on until Easter! As they say the rest is history and we have Johannes and the English guests to thank for Alpine Winter holidays. 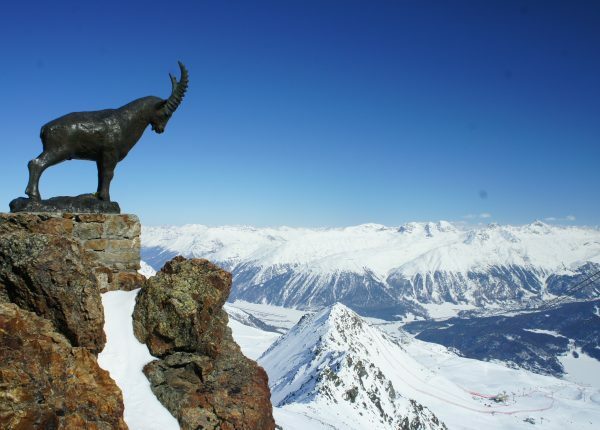 St. Moritz went on to become the largest winter sports region in Switzerland with its breathtaking landscapes, glamorous lifestyle and the first palace hotels of Europe. It also has the most glamorous calendar of events with the legendary White Turf horse races, the Snow Polo World Cup, Cricket on Ice and the highly popular Gourmet Festival amongst others. It also became famous for the death defying ‘Cresta Run’ the natural ice skeleton toboggan track. The Engadin boasts some of the best culinary talents with 300 restaurants in the region, of which 30 have been awarded a total of 441 GaultMillau points and 8 Michelin stars between them. Top chef Rolf Fliegauf earned himself 2 of these Michelin stars in 2012 for the fabulous Ecco on Snow. The town is famous for it chic fashion labels and elegant boutiques especially along the street Via Serlas, Europe’s highest shopping avenue. Apparently it has the highest density of of premium luxury brands such as Bulgari who opened one of their first shops here in 1906. In the Egadin valley there are 11 areas to ski with 4 of them being of some considerable size. My two favourite largest areas are Corviglia and Corvatsch/Furtschellas. Initially I thought St. Moritz might all be Champagne and luxury with skiing as an afterthought, but how wrong was I? 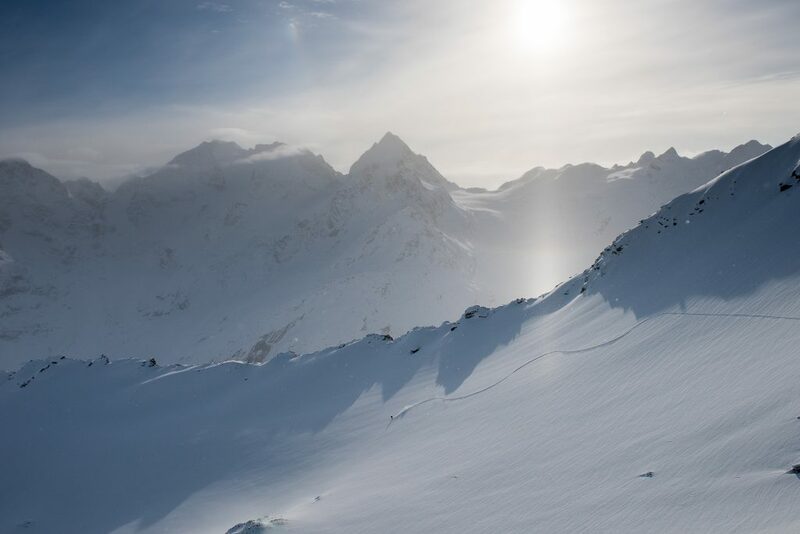 It has so much to offer with its huge FIS-quality slopes in the Corviglia area where we watched the men’s and women’s Audi FIS ski World Cup to the quieter and snow sure Corvatsch area with its breathtaking peaks, glaciers and endless free-ride opportunities. Two very different areas with very different characteristics. Wherever you stand the views are spectacular in the Engadine region. The Hahnensee Express shuttle bus goes direct from St. Moritz Bad (Signal bus station) to Silvaplana Surlej (Corvatsch cable car station) every half an hour in both directions, so travelling between the Corvatsch and Corviglia ski areas is easy. Note that the lifts in the region open at 7:45am so one can make first tracks before the rest of St. Moritz awakens. Also, if one books more than one night at a hotel offering the ‘Hotel and Ski Pass’ combination one gets the ski pass for a mere CHF 38. BEGINNERS- About 18% of St. Moritz are Blue runs. 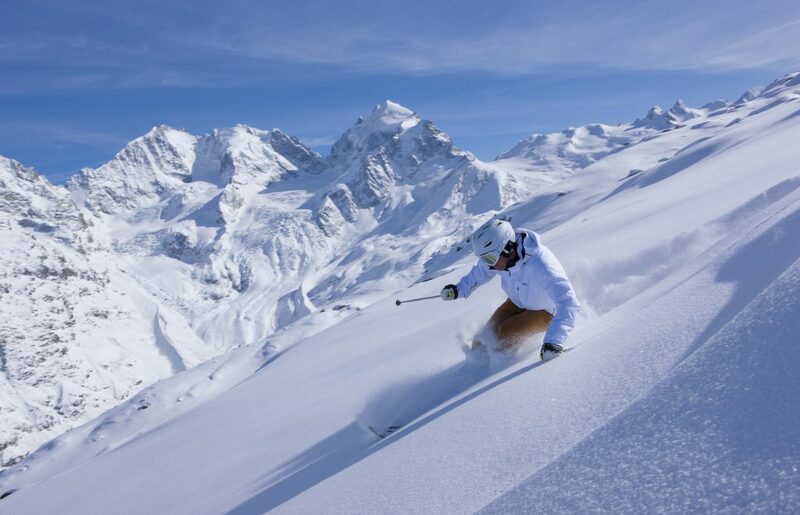 Corviglia has a good connection of Blue pistes, but complete beginners may want to look to some of the smaller Engadine villages like Zuoz, Pontresina or Celerina. INTERMEDIATE- The Corviglia area is an intermediate’s paradise, with blues and very skiable reds covering the area. Most of the pistes are long and tend to be very wide, so there is plenty of room to manoeuvre. 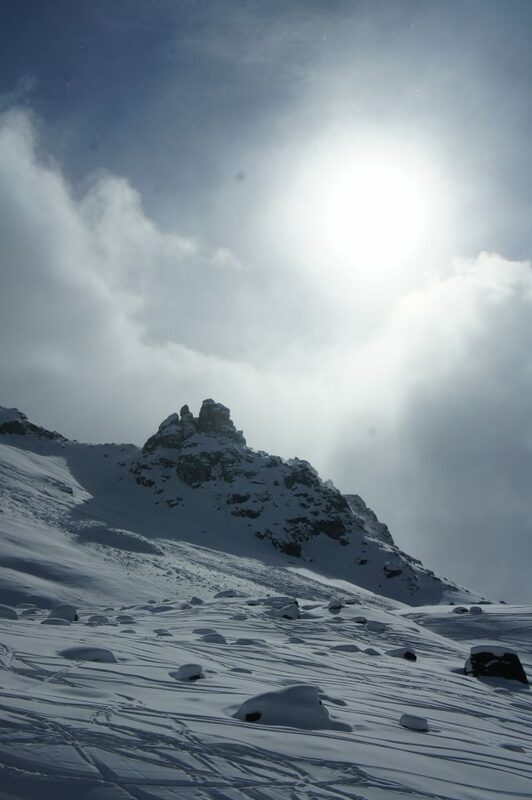 For those wanting to experience their first black piste, it is worth checking out the Gluna Piste. ADVANCED– There are not a vast array of black pistes around the St. Moritz region but the ones that exist are fun and the Corvatsch area will tend to please the expert skiers the most. 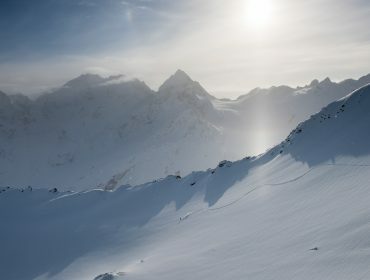 – OFF PISTE- The Corvatsch area offers the free-ride opportunities and because it is mostly north facing the off-piste tends to keep pretty well. Freeride areas of note are: Lagalb to La Rösa and Val Arlas (Diavolezza). 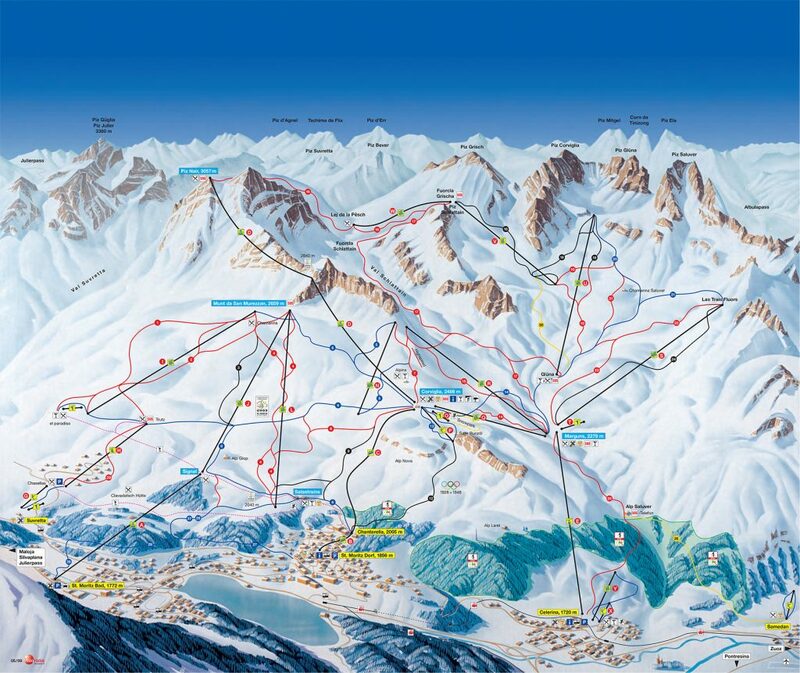 Total 163km of piste – 16 Blue (42km) / 35 Red (79km) / 10 Black (34km) / 1 terrain park. 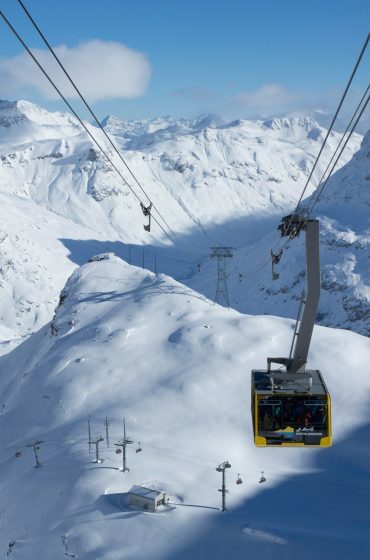 Lift system 24 total – 2 funiculars / 3 cable cars / 12 Chair lifts / 7 Drag lifts. 400m fixed giant slalom course- one’s attempt is filmed and available to download. Great skiing area spread across the Corviglia mountain with many red runs. Our favourite runs are in the Lej da la Pêsch area and the ‘04 Coviglia’ piste if you do not get a chance to ski the women’s and men’s ‘Engadina’ and ‘Corviglia’ downhill pistes. When it comes to eating on the mountain, you will find no better place to eat than Che Cha at the bottom of the Blue piste 06 ‘Standard Variante’ or alternatively by road. 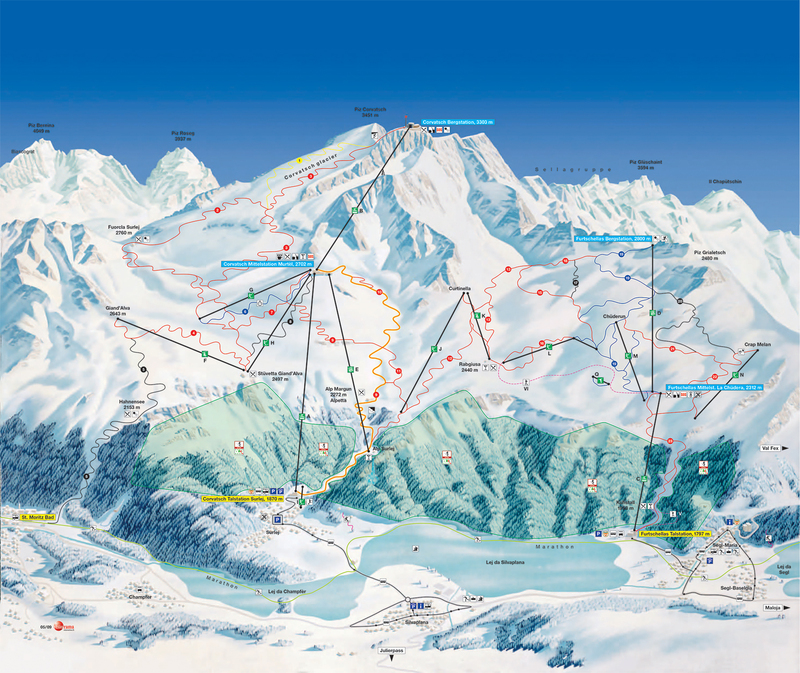 Total 120km of piste – 6 Blue (13km) / 36 Red (89.3km) / 6 Black (17.7km) / 1 terrain park. 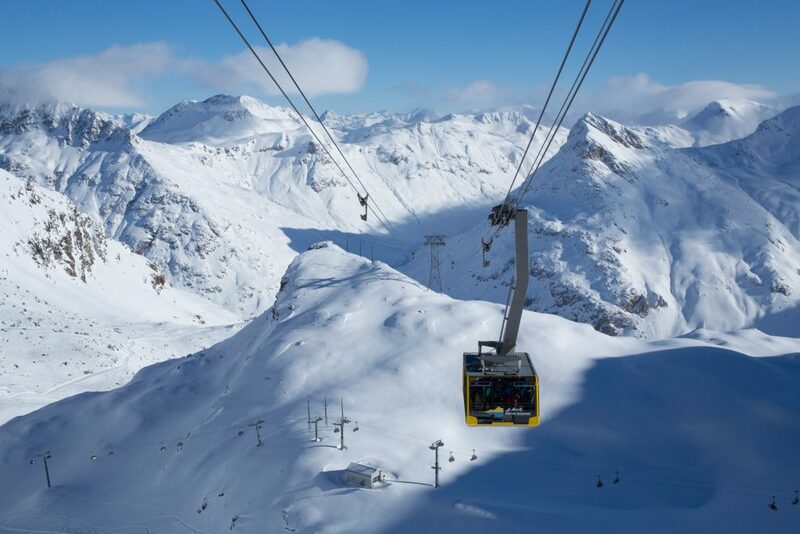 Lift system 14 total – 3 cable cars / 5 Chair lifts / 6 Drag lifts. Corvatsch has a very different feel to Corviglia with a more free-ride vibe. It is not unusual for the powder snow to stick around right through to April. It also has the largest freestyle terrain parks in Switzerland at the Murtèl middle station. The Black 9km ‘05-Hahnensee’ piste down to St. Moritz is worth a slide. 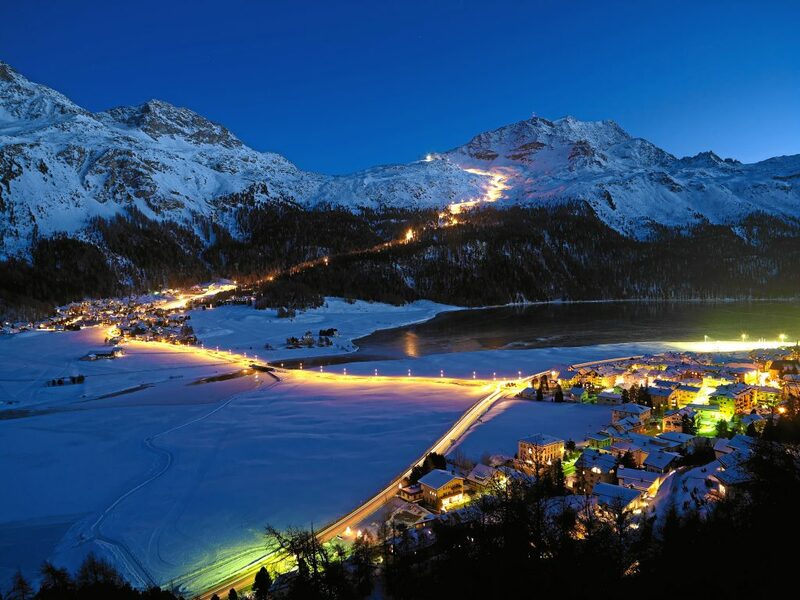 On Fridays, Switzerland’s longest floodlit piste at 4.2km is open 7pm-1am Dec-Jan / 7pm-2am Feb-Apr. It can also be privately booked on other nights. We loved all of the pistes but particularly liked the very quiet ‘01-Standard’ leading to ‘02-Fuorcla’. Favourite mountain restaurants on this side were ‘Fuorcla Surlej’ and ‘Alpetta’. We recommend the 5* Grand Hotel Des Bains Kempinski, the 5* Hotel The Suvretta House and the 4* Superior Nira Alpina. 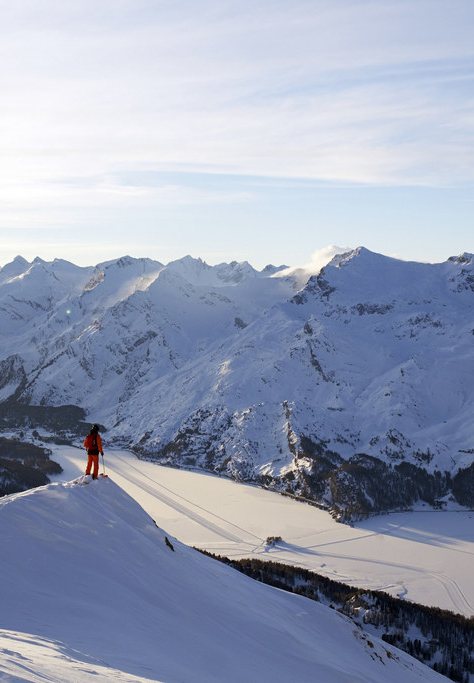 We recommend Ski Cool of St. Moritz.